Ross Griffiths is gentle when handling a pair of 88-year-old, off-white silk stockings, one of the more unusual artifacts in the nascent but growing Worcester State archives. “There are many ways these tell the story of Worcester State,” he says. In the height of the Roaring ’20s, months before the October stock market crash, Helen—like a lot of her fellow teachers-in-training from modest city families—was proud of this indulgence that marked a significant milestone in her educational journey, observes Griffiths, who is in his second year as WSU’s first full-time archivist. “It also shows that life at the Normal School was like living at high school, with plenty of oversight from school leaders, which makes sense since they were training to be teachers and live in that world,” he says. Likewise, two numbered wooden auditorium seats, salvaged after the renovation of the Fuller Theater in 2009, tell a story about what daily life was like for early students at Worcester State Teachers College. Other artifacts represent different snapshots of WSU history: A small, crusted horseshoe uncovered during the construction of the Ghosh Center for Science and Technology in 1999 probably came from Willow Farm, which sat on the land that was sold to the state when the Normal School moved to Chandler Street from its original location across town in 1932. Other items are more conventional and comprehensive in scope. Griffiths has created a searchable collection of all Commencement programs from 1876 to the present, valuable records of history that detail more than 130 years of graduates, administrator, and guest speaker names, and every song performed. “They are all in wonderful condition. Someone was thinking ahead,” says Griffiths. Student newspapers are also an interesting resource for understanding the past. Griffiths points to a news story from 1966 about a student who was threatened with expulsion because he grew a mustache. “It tells you what kind of place this was, and how it was reflective of the culture of the time,” he says. More than just nostalgia, Griffiths’ goal in building the archives is also an academic one—to provide resources for researchers, both internal and external. 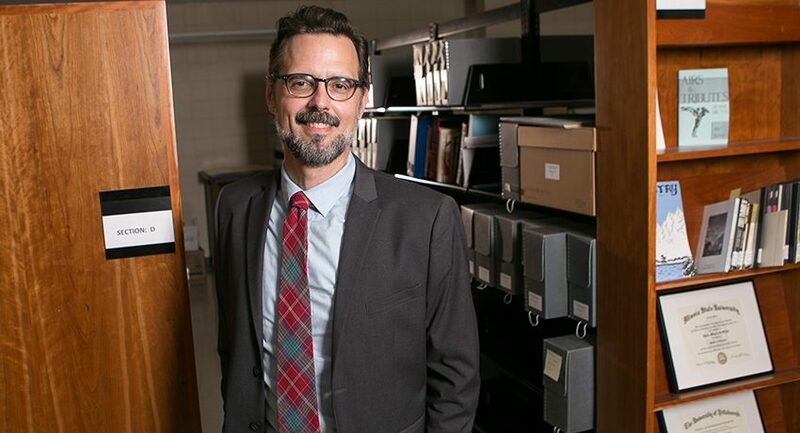 He came to WSU in 2015 from Illinois State University, where he was the director of preservation and university archives at the Milner Library, attracted to the prospect of starting an archive from scratch, especially at a university with such a long history. “I like being able to take an existing set of materials and getting everything organized and described so researchers can find what they are looking for,” he says. He spent the first eight months going shelf by shelf through the many items set aside for posterity by a long line of dedicated secretaries and forward-thinking administrators and faculty. Besides the Commencement programs, he has created several other collections with finding guides, including one with materials documenting the construction and maintenance of campus buildings, equipment, and grounds from 1880 to 2000. Now that he has a handle on the existing material in the archive, he has begun reaching out to campus offices to evaluate potential assets that have been sitting in old filing cabinets or long forgotten in storage. He is especially interested when long-time faculty and staff retire and start cleaning out their offices. “The key here is awareness. I’m making progress in letting people know that I’m here and what I’m looking for. I’m getting more and more calls from people asking if I want to review items headed for the trash or recycling bin,” he says. On a recent July day, he eagerly looked through a box of material from recently retired Associate Dean of Student Affairs Tim Sullivan. Griffiths has been working closely with Assistant Professor of Urban Studies and Director of WSU’s CityLab Tom Conroy, Ph.D., who is in the process of writing an illustrative history book of Worcester State, scheduled to be published by Arcadia Publishing as part of its campus history series. Normal Schools came out of the education reform movement by Horace Mann, who Conroy describes as a pioneer in assessing institutional structure and bringing together experts to deal with big issues. Worcester’s was actually the fifth Normal School in the state, founded well after the first in Framingham in 1839. 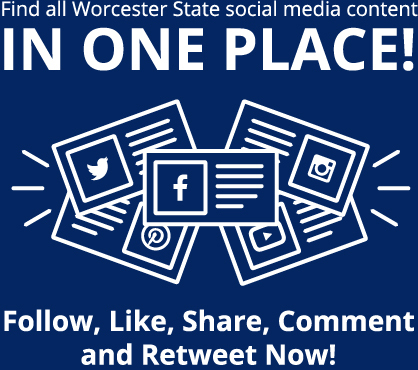 Its creation and growth reflected Worcester’s growing importance in the late 1800s, as canals and then trains brought an influx of industry and workers to the area, along with the need for a more robust and structured educational system for a diverse student body. The original campus was established on St. Ann’s Hill at 80 Prospect St., in the southwest corner of the triangle now formed by Shrewsbury Street, Route 290, and Belmont Street (Route 9). Under the leadership of principal E. Harlow Russell and apprentice supervisor Rebecca Jones, the teacher training school offered two- and three-year programs of study. That site, which now holds City View Discovery School, actually included a small dormitory, attached to the academic building, for a handful of women who were carefully monitored by school leadership. The normal school system was inventive for the time, and that foundation can be seen in the University’s current incarnation, says Conroy. “We’ve always tried to push the parameters of education. One of the distinctive qualities of our University is that we easily cross disciplines, like when faculty from the Urban Studies Department worked with visual and performing arts faculty on the CitySpeak project. That doesn’t happen everywhere,” he says. He notes that a long-standing urban studies oral history project has never addressed Worcester State history specifically, but has potential for the future. As an example, he tells the story of an alumna who told him her mother, also an alumna, refused to enter through the front doors of the Helen G. Shaughnessy Administration Building because that was just not done when she was a student. In addition to securing a pipeline for qualifying items on campus, Griffiths is interested in reaching out to alumni to fill in some of the many holes of the archives—although with some parameters. For instance, all the yearbooks were digitized through a project last year, so old yearbooks are not needed. “The Fuller Theater chairs that were salvaged out of the dumpster might not sell for much on eBay, but to the archives, they’re valuable because of the stories they tell,” he adds. In particular, he is interested in items from the 1950s and 1960s—photos, research papers, meeting minutes, and the like, which are not well represented in the archives. Items with sentimental value, or that are too cumbersome to fit within the small archive space in the LRC, can be photographed and/or scanned with a comprehensive explanation included. Another outcome of a more comprehensive recording of the University’s history is creating an easier way to keep track of the milestones and anniversaries the WSU community should be celebrating. For instance, in 2020, the LRC will be celebrating its 50th anniversary and the Ghosh Center for Science and Technology will be marking 20 years. Alumni with items they would like to be considered for inclusion in the archives should contact Griffiths by email at rgriffiths@worcester.edu or by phone at 508-929-8391. This article was first featured in the 2017 fall issue of the Worcester State Magazine. Since Hurricanes Irma and Maria ravaged Puerto Rico and the U.S. Virgin Islands in September, the Worcester State University community and the state’s Department of Higher Education have been working hard to ensure that those who were in school when disaster struck are able to continue their studies here. Student leaders stepped into action to raise funds for Puerto Rico relief, meeting . 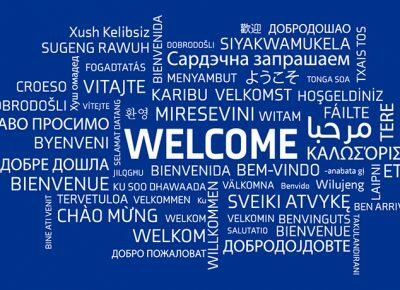 . .
I’m so impressed with how Worcester State University continues to grow and change, not only physically but with its student population and academic programs offered. I wish I had these things the current students have when I attended WSU from 1981 through 1986. The leaders need to continue to expand the vision of WSU in the 21st century. Where can I find a brief history of SWU?